To me, game dice just mean fun. I have a good stock pile of regular size dice from various games, but thought it would be fun to actually have big a set that were super size and specific to CC. You can buy some from teaching supply places, or probably on Amazon, but not for less than $3. I found craft styrofoam at the $1 store that are approximately 4". I attempted to write on the cubes with markers, but the styrofoam "ate" the marker tips. So, I had a bunch of craft foam sheets that I cut to size and wrote my numbers on. I used the left over fun duct tape (from my transportable trifold white board project) because anything with patterned duct tape is just fun. 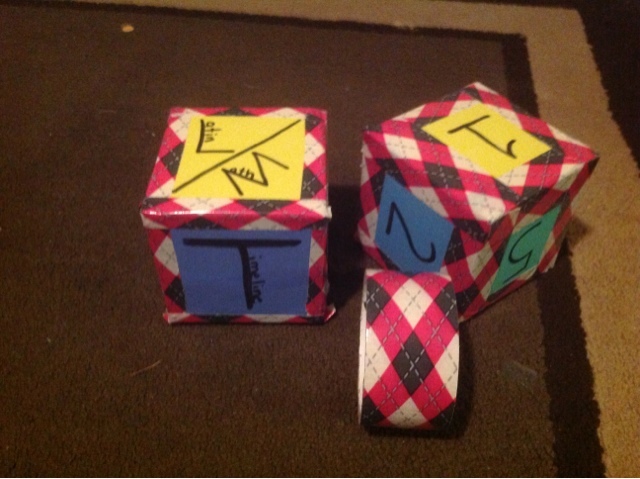 Dice=fun, pattern duct tape= fun, so this is double fun. After writing the numbers on the foam, I taped them to each other around the cube. I noticed the width of the duct tape really made for a small space to have the numbers on. So, when I did the second cube I cut the duct tape lengths in half. you could simply take a tally mark score on paper or a board in your room. Easy, cheap, simple, FUN, FUN! Side note: if you have crazy kids in your room that want to toss the dii all over, you could have them toss them into a box to keep the game contained.